liver cells at eight days after infection. 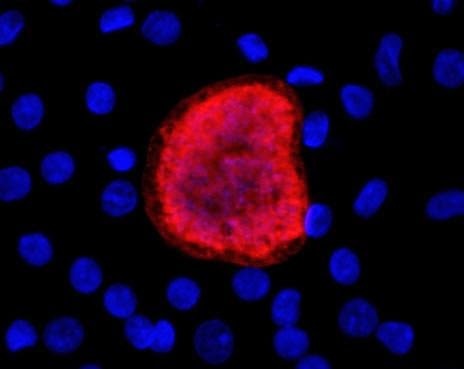 MIT researchers use induced pluripotent stem cells, to screen potential antimalarial drugs and vaccines for their ability to treat the liver stage of malaria infection. Researchers at the Massachusetts Institute of Technology (MIT) have engineered a way to use human liver cells, derived from induced pluripotent stem cells, to screen potential antimalarial drugs and vaccines for their ability to treat the liver stage of malaria infection. This new approach may offer new opportunities for personalized antimalarial drug testing and the development of more effective individually tailored drugs to combat the disease, which causes more than 500,000 deaths worldwide each year. The scientists presented their work in the February 5th issue of Stem Cell Reports, the official journal of the International Society for Stem Cell Research. "Our platform can be used for testing candidate drugs that act against the parasite in the early liver stages, before it causes disease in the blood and spreads back to the mosquito vector. This is especially important given the increasing occurrence of drug-resistant strains of malaria in the field." said senior study author Sangeeta Bhatia, MD, PhD, the director of MIT's Laboratory for Multiscale Regenerative Technologies and a biomedical engineer at Brigham and Women's Hospital. Malaria is caused by parasites that spread between humans through the bites of infected mosquitoes. In humans, the parasites grow and multiply first in liver cells and then in red blood cells where they cause the physical symptoms of the disease. 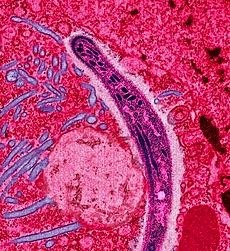 One major challenge to malaria eradication is that the parasites can persist in the liver and cause relapses by invading the bloodstream weeks or even years later. Drugs or vaccines that target the liver stage could block the initial round of blood infection or perhaps even eradicate the dormant parasite pool and prevent relapse. However, current methods for modeling liver-stage malaria in a dish are limited by the small available pool of liver cells from human donors and the lack of genetic diversity of these donor cells. These challenges have made it difficult not only to determine how genetics influences responses to antimalarial drugs, but also to establish a method to explore the development of personalized drugs for individual patients. To overcome these hurdles, Bhatia and her team reprogrammed human skin cells into induced pluripotent stem cells (iPSCs)--embryonic-like stem cells capable of turning into other specific cell types relevant for studying a particular disease. iPSCs are a potentially renewable source of liver cells that retain the donor's genetic makeup and can be generated from any human donor. These features allow a broad spectrum of the human population to be represented in drug screens and provide the opportunity to test individualized responses to antimalarial drugs as well as genetic factors that determine susceptibility to infection. The researchers infected iPSC-derived liver cells with various malaria parasites to model liver-stage malaria in the lab. These cells were sensitive to an antimalarial drug called atovaquone; chemical maturation through exposure to small molecules also made the cells sensitive to another antimalarial drug called primaquine, demonstrating the value of this approach for testing new antimalarial drugs. "Moving forward, we hope to adapt the iPSC-derived liver cells to scalable, high-throughput culture formats to support fast, efficient antimalarial drug screens. The use of iPSC-derived liver cells to model liver-stage malaria in a dish opens the door to study the influence of host genetics on antimalarial drug efficacy and lays the foundation for their use in antimalarial drug discovery." said lead study author Shengyong Ng, a postdoctoral researcher in Bhatia's lab. Malaria is a mosquito-borne infectious disease of humans and other animals caused by parasitic protozoans (a group of single-celled microorganism) belonging to the genus Plasmodium. Malaria causes symptoms that typically include fever, fatigue, vomiting and headaches. In severe cases it can cause yellow skin, seizures, coma or death. The disease is transmitted by the biting of mosquitos, and the symptoms usually begin ten to fifteen days after being bitten. In those who have not been appropriately treated disease may recur months later. In those who have recently survived an infection, re-infection typically causes milder symptoms. This partial resistance disappears over months to years if there is no ongoing exposure to malaria.